We initiated a Started Griffon Program to fill an existing need. We feel that the first year in a dogs life is the most important in terms of learning and training. We expose the puppies to more field time, birds, water, wild birds and actual hunting, than most dogs get in two or even three years at home. We all have busy lives and may not have the time, access to training fields, water, birds, or maybe the knowledge for that all important start to get the most out of our hunting partners. And even with the best of intentions, life has a habit of getting in the way of training and hunting. The early exposure is often all that is needed in the way of training for the 10-12 years you will have your dog. We limit the amount of started puppies to 6 a year, due to the time commitment involved, so if this is something that interests you, give us a call or email to get on the list. We are usually booked a year in advance for the next years started dogs, so if this is something that interests you plan early. I keep the puppies until the last week in Sept, and then they are ready to go to their new homes. We start them in the field at 6 wks for short walks 2-3 times a day, introduce them to water work, gunfire condition them, put them on birds, and work on their retrieving, and get them ready to hunt. We start them on quail early, when they are using their noses and searching and flash pointing, we switch them to pigeons so they learn they can't catch them. We then start killing birds and working on the retrieve, We also start working on steadiness, and work on whistle commands. We use 1 toot on the whistle for turn and 2 toots for come. Our work in the water consists of bumpers, dead pigeons, live pigeons, dead ducks and finally live shackled ducks (cripples). When the season opens in Sept, we take them out on sharptail and huns, 5 days a week until the last week. 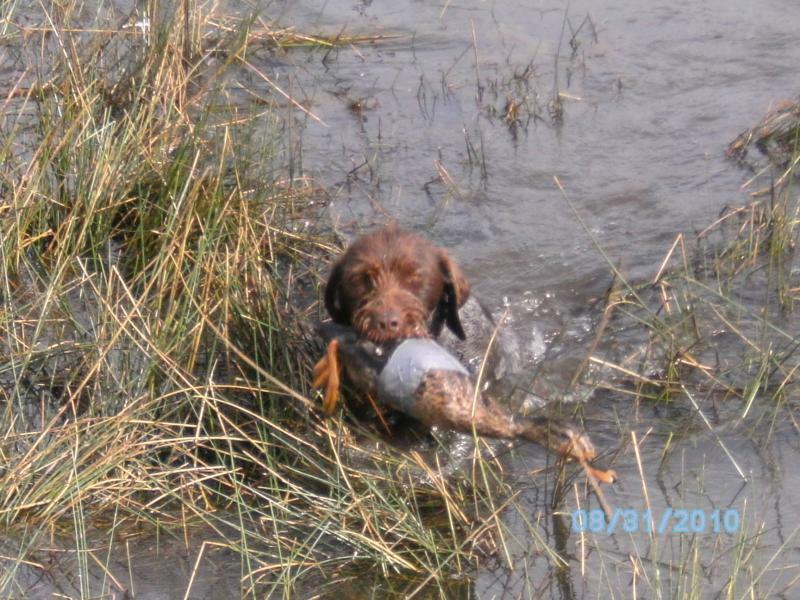 When you come to pick up your pup, we ask that you give us a day or two and we take you out with your pup on a hunt. If you prefer, we can we can also go on a duck hunt in the morning and hunt upland in the afternoon. These are not finished dogs, they will make mistakes, but you will be able to take them out and get a good hunt out of them the first year. They leave here actively hunting, pointing and holding until you arrive, when the bird is shot they will retrieve, usually right to hand, and will have been exposed to hunting with another dog and backing. We ask that the first payment of $300 be made to reserve your pup, $1500 when the pup is 6 wks old, and the remaining balance of $1700 be paid when you pick up the pup. If you are not completly satisfied with the pup's training you can pay $300 to cover the cost of food and shots (we take care of all shots and worming including the first years rabies shots) and take the pup home or we will refund your initial purchase of $1800, and will recommend you to other breeders. For videos of what we do, click on the link below, or go to youtube under Shock Kennels. Copyright 2011 Shock Kennels. All rights reserved.